STRANGE TREES COMIC BOOK CHARACTER! 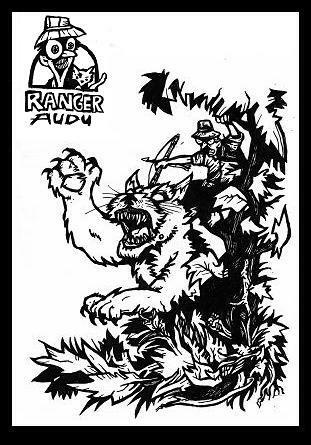 Audubon was once the great ranger and protector if the legendary green forest. Located to the north of the City of Gears the mystical reserve was an endless source of resources and wonders unthought of by urban dwellers. Unfortunately such natural extravagance attracts the most human of horrors so for many years Audu was responsible for thwarting poachers, developers and chemists with evil schemes. The forest was equally famed for it’s vast wildlife as that of it’s apparently limitless resources. Plant life and animals of the rarest ecological value thrived there. In one such instance an entanglement of vines was unraveling previously unsolvable quantum equations. At another time it was proven on one expedition, guided by Audu, that a large malformed monster frog species was absolutely inherent in the production of the worlds fresh waters! Many medicinal, ecological and historical discovers were kept by the deep thick woods, and whenever times seemed desperate, the trees shared their knowledge. At first Audu purchased forest property commercially with the intention of conducting research of his strange trees. However his laboratory was frequently pillaged by foresters and more time was spent fending off hunters than studying the land. Eventually Audu organized with local aborigines and set up a stern watch. The new alliance flourished and larger portions of the forest were preserved. Following Audu’s victorious battle with a violent chemical agent released on the woodlands, Government officials took notice of the groups actions. Obviously there had been much political discourse regarding the massive green forest before, but it was not until the incident at the reserve’s south gates that any real action was taken. The funding went to Audu and his crew and despite press reports of environmentalism, everyone new this was a band aid implemented to misdirect attention from the 26 first nations people murdered in cold blood by official guardians soldiers at the southern entrance. Audu used the ill-gotten finances to protect, preserve and study the Green Forest with the utmost of care. Under his watch the plants grew taller than ever before. New species were emerging and science was having a hay day without once interrupting the magical rebirth of the woods. Alas business is business and as the memory of the Southern Gates faded and new continental interests arouse, Audu’s project lost it’s funding and licence as the forest was sold. Following the demolition Audu wandered the globe aimlessly and near mute until he found him self collapsing on the doorstep of the Old Man’s repair shop. Audu had made his way back to the Gear and decidedly took to menial chores for the Old Man.